One of the features that modern home builders are diligent about always including is good lighting. In Portland modern homes, you’ll find large windows complementing creative lighting features that add artistic form and function. As the winter days grow shorter, good lighting becomes essential in new modern homes. Chandeliers: With variety of sizes, shapes, materials and colors, chandeliers easily add ambient lighting and a focal point to a room. Pendant lights: Pendant lights are a great way to complement a room. The color of the shade should not be too overpowering, nor should its size seem to overwhelm a space. Stagger pendant lights at various heights to add visual interest, or use them to define a space in a new modern home’s open floor plan. Arching, sculptural floor lamps: Large, arching floor lamps are perfect for a minimalistic-styled space in a modern home. It offers task lighting, ambient lighting and flexibility. Depending on the size of the room and availability of space, the lamp can ingeniously light the space over an armchair, couch, dining table, desk or bed. Arm lamps: Popularized by Serge Mouille, arm lamps can be the more compact answer to structural floor lamps. While they still occupy space on the floor, they don’t necessarily take up several feet of floor space to light and adorn a room. This type of lighting can come with multiple extending arms or single-shade versions for smaller spaces. Diffused lighting: “Lighting architect” Pøul Henningsen mastered ambient lighting with his tiered pendants that diffuse and reflect light equally throughout a space. Henningsen’s lamps are works of art that use tiered leaves along a circular base to create the look of an upside down artichoke. He also created pendant lamps made from concentric circular shades at the end of a cone that also absorb some light spectrums using hidden red and blue colors. The right lighting can transform any home or space. Home buyers should take time to research their lighting options in order to find a perfect lighting complement to their new modern home. 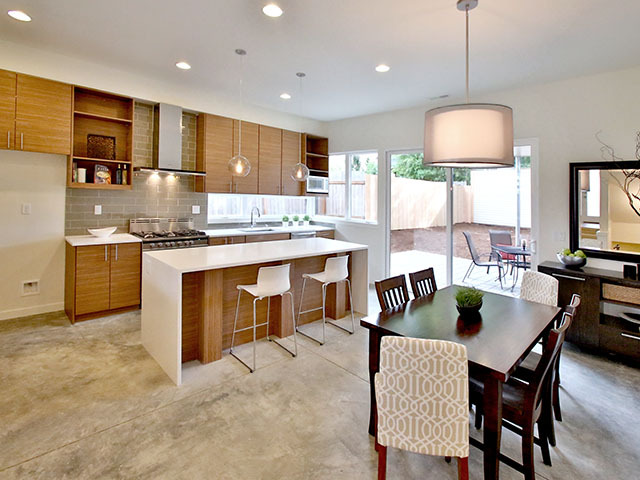 To learn more about available new modern homes Portland area, contact H. Hudson Homes.